State Senators Creigh Deeds (D-Bath) and Emmett Hanger (R-Mount Solon) were the only two Senators in last week’s Republican-proposed mid-decade redistricting to be thrown into the same district. Should both seek re-election without moving, they would battle each other for the new 24th District in 2015, 24 years after Deeds defeated then-Delegate Emmett Hanger for House District 18 in 1991. In the decades since, elections and redistricting have radically shifted the territory they have represented, overlapping and adjacent, to the point where they are barely connected at all to their original bases, shown in the animation at right. 1983 Election (not shown) – Emmett Hanger elected to the House District 26. 1990 Census – Democratic-controlled redistricting pushes Hanger into House District 18. 1991 Election – Deeds defeats Hanger in House District 18. 1995 Election – Hanger is elected to the Senate District 24, they share the area in purple. 2000 Census – Republican-controlled redistricting pushes Deeds into House District 12. Deeds territory heads south, Hanger territory heads east and they no longer share territory. 2001 Special – State Sen. Emily Couric dies and Deeds, after winning re-election to his House seat, wins a special election to Senate District 25. 2011 Census – Democratic-controlled redistricting stretches Hanger’s district even further east. 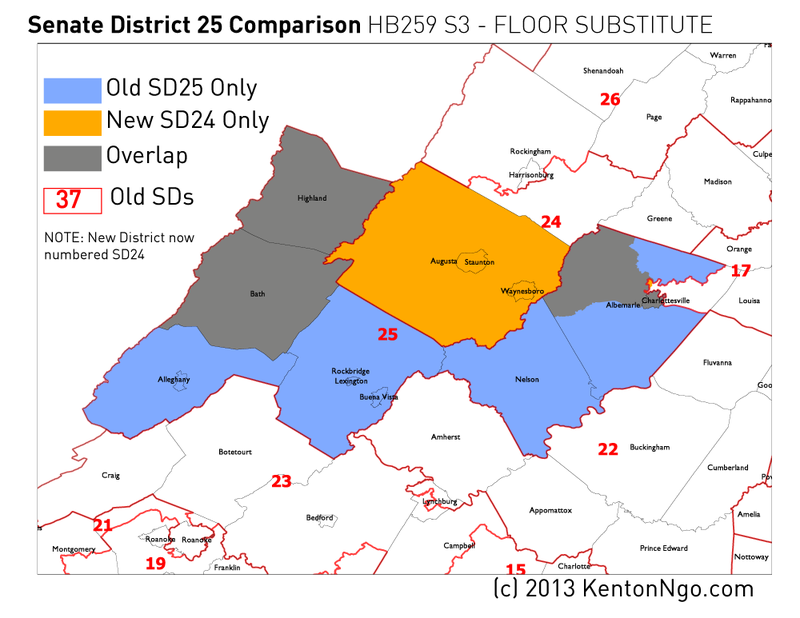 2013 Mid-Decade – Proposed redistricting places both Deeds and Hanger into Senate District 24. I have updated my previous visualization of 2012 polling-place returns in Virginia that showed a serious racial divide between diverse precincts and white precincts to include the mid-decade district lines rammed through the State Senate on Monday. See previous for comparison maps and old to new district redistribution figures. Areas are shaded by their total non-white percentage and also whether those areas were more ▰ Black (orange), ▰ Hispanic (purple), or ▰ Asian (green). ● Blue dots showing Democratic precincts cluster in diverse areas, growing more intense as nonwhite population increases, while ● red dots showing Republican precincts correlate tightly to white areas. Note the new Senate District 25 in Southside Virginia, which is a new majority-black (orange) district, and in Northern Virginia Senate District 37, which is a minority coalition district. These were deliberately drawn to pass Voting Rights Act muster. Full-size graphic after the jump. UPDATE 7:35PM: Using official shapefile released by Virginia Division of Legislative Services, see this Google map of new districts. See this post for comparison maps and continuing coverage. 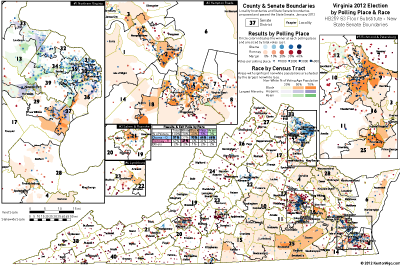 Using the bill provided by Not Larry Sabato I have been able to create some preliminary maps of the mid-decade redistricting currently before the House of Delegates, passed today by the State Senate. UPDATE 7:15PM: Also targeted is Senate District 39, where State Senator George Barker narrowly won a district stretching from Alexandria City through southern Fairfax County into Prince William County. Republicans traded heavily Democratic areas of Alexandria and Fairfax County and swapped them for more precarious turf previously in SD37. Clifton-based Barker picks up large sections of the communities of West Springfield, Centreville, and Chantilly. UPDATE 7:35PM: Using official shapefile released by Virginia Division of Legislative Services, see this Google map of new districts. Click each district for information. UPDATE 9:24PM: The following table shows the proportions of new State Senate Districts as proposed by the Senate Republicans by current State Senate district. Of the 6,147,347 voting age people in Virginia in Census 2010, 2,776,292 would be moved into a new district. UPDATE JAN 22 5:45PM: See update for precinct-level map of 2012 returns with race data that clearly shows the racial geography that informed creation of new VRA-compliant districts. Click below for full-size version. Previous analysis here has shown that the Electoral College, small states are vastly overrepresented due to minimum seat thresholds and the mathematical properties of rounding off small quantities. 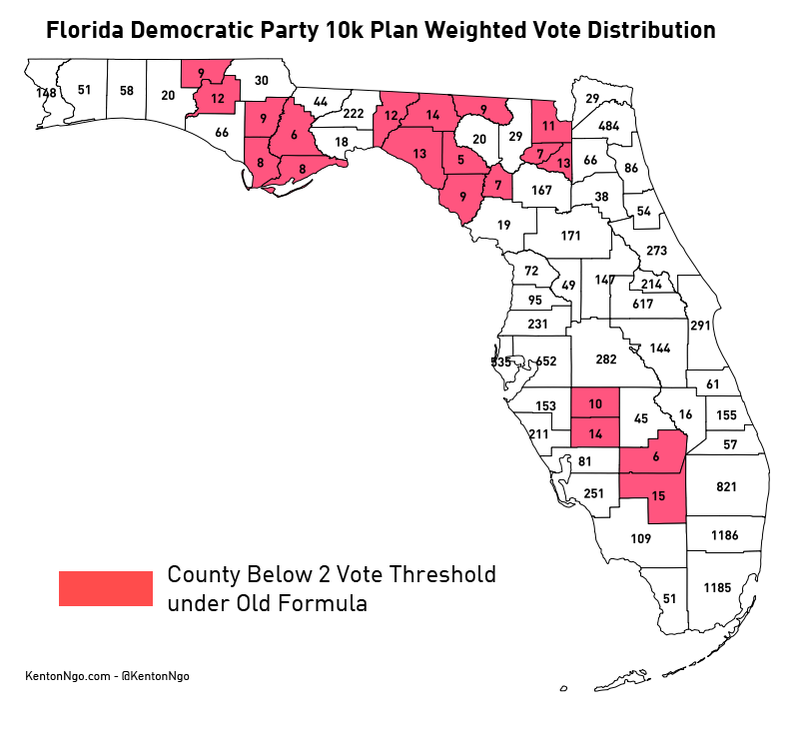 The upcoming Florida Democratic Party election for state chair, for completely unnecessary reasons, has the exact same problems: overweighting of the smallest, most rural localities. Small numbers are the enemy of accurate representation: in addition to wreaking havoc in proportional systems like in Hong Kong’s LegCo (previously), it also causes trouble in weighted vote systems like the Florida Democratic Party’s, which I will use as an example here. 1) Lafayette County, a small county with only 3,102 registered Democrats, will wield 338% of the power it should. 2) Jackson County (17,880 registered Democrats) will cast the same number of votes as Lafayette despite deserving 643% more weight. 3) The 20 smallest counties should cast 19.58 weighted votes out of the total 1,022 statewide committee weighted votes, but will cast 40: over twice as much. The output of this formula is then rounded to the nearest even number. Counties that are rounded down to 0 receive 2 votes anyway. This is similar to how in the Electoral College, Wyoming is less than 3/538ths of the population of the United States, but is mandated to receive 3/538ths of the Electoral College votes anyway. 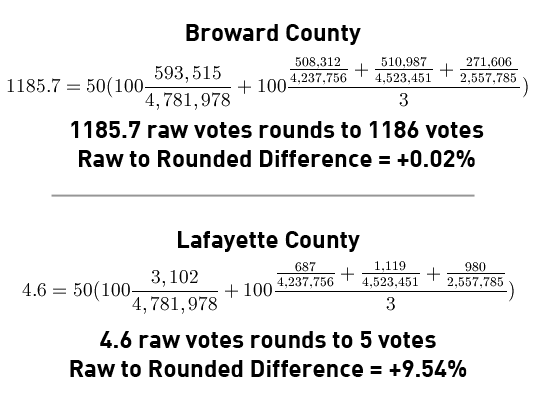 Let’s work through the two counties that receive the largest and smallest votes under this formula: Broward County in South Florida, and Lafayette County in the Panhandle. As you can see, the needlessly small multiplier of 5 gives Lafayette fewer votes than the minimum vote threshold. Once the 2 votes are given, its vote value soars 338%! Even worse, requiring that values be rounded to the nearest even number eliminates the possibility of giving Lafayette County a much closer vote value of 1. When this formula outputs very small quantities, the effects of rounding are absolutely enormous. This yields the following map of weighted vote allocations. Democratic elected officials also receive votes under the party bylaws as fixed percentage of statewide committee votes, which are also shown. Highlighted in red are counties that do not round to the 2 vote threshold on their own, and are arbitrarily given the minimum 2 votes. Those 20 counties should round to either 0 or 1 votes. Combined, they should cast 19.58 votes, but instead receive 40 votes, more than double! Most of those counties are in the Panhandle, which can be considered to be a 20-vote free bonus to a Panhandle-based candidate if they vote as bloc, an unfair advantage in a close election brought on not by increased support among Democrats but by silly rounding problems. Fortunately, there is an extremely simple fix: increase the multiplier as below. This yields 10,001 votes total distributed among county committees instead of 1,022, so we’ll call this formula the 10k Plan. Let’s also eliminate the requirement that votes be rounded to the nearest even number, and instead use the nearest whole number. (Even numbers are used in the original plan because each county’s votes are divided between its two state committeepeople. Are half-votes so hard to calculate? Republicans manage to do it.) 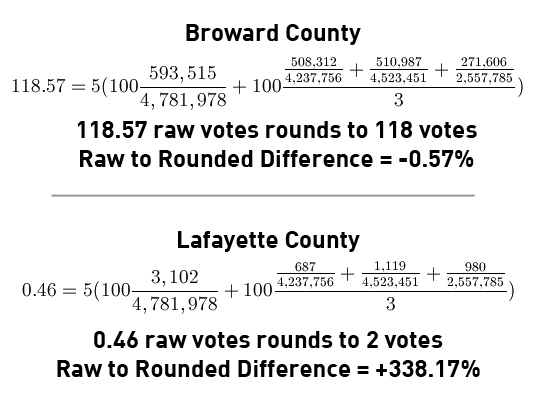 The following chart shows the impact of rounding to the nearest whole number on counties sorted by their size: the percentage difference between their raw votes and their rounded votes. 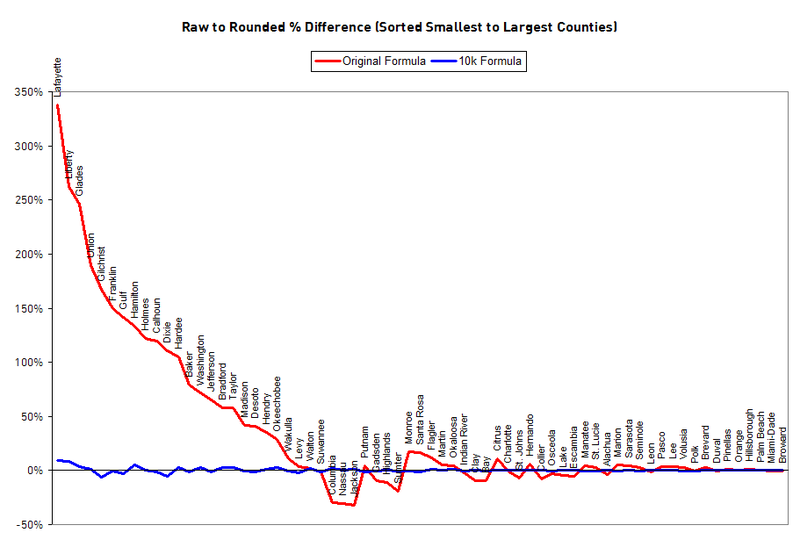 For the smallest counties, their impact under the old formula is doubled or tripled! As size increases, the relative effect of rounding reaches zero. Rounding effects using the new formula are drastically reduced. Let’s redo the example of Broward and Lafayette Counties. As you can see, adding an extra 0 to the multiplier and eliminating even-only rounding results in a much more accurate distribution of weighted votes. Finally, it yields the following map of weighted votes. Note how Jackson County now casts 30 votes and Lafayette County 5 votes, which reflects the magnitude of their size difference. Under the old plan they both cast 2 votes. 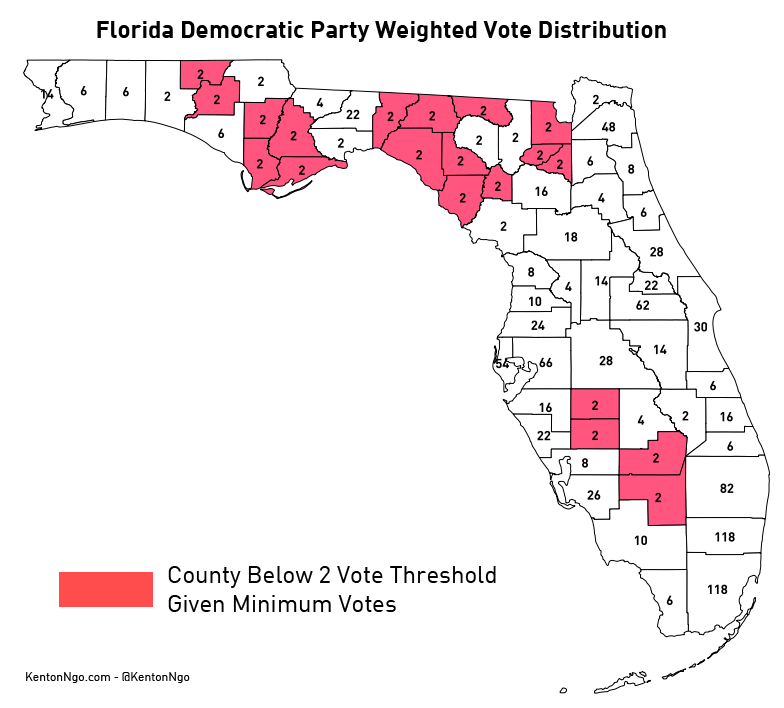 The Florida Democratic Party can come to decisions equally by using either apportionment (giving more populous localities more seats) or weighting (increasing the share of votes cast by populous localities without increasing the number of representatives). In a state as geographically large as Florida, weighting can be a sensible solution, but only if done in a manner that avoids this easy pitfall of a small multiplier. Since weighting obviates the need to recruit more committeemen or increase the size of the committee to an unmanageable size like apportionment would, the weighting multiplier can be increased infinitely without cost. The spreadsheet with these calculations is embedded below for your perusal and analysis. Please contact me or comment below if you find errors or have suggestions. Tropical Storm Debby gives my apartment a waterfront view. Last week, after furious protest from New York City area Republicans, House Speaker John Boehner allowed $9.7 billion in Hurricane Sandy relief to pass the House of Representatives on a suspension vote. Among the 67 that voted no were two newly-elected ultraconservative Republicans: Rep. Ted Yoho and Rep. Ron DeSantis, both of whom represent coastal districts in North Florida. That’s one hell of a brazen commitment to “principle” coming from two Congressmen that represent hurricane-friendly turf! Below, I’ve mapped historic hurricane tracks over territory that is now represented by our Tea Party twins. Let’s hope that the rest of America’s members of Congress are forgiving when (not if) North Florida gets whacked with another hurricane and needs a relief bill. The gods of ironic punishment have plenty to work with! The below map shows only direct hits by the storm centers. 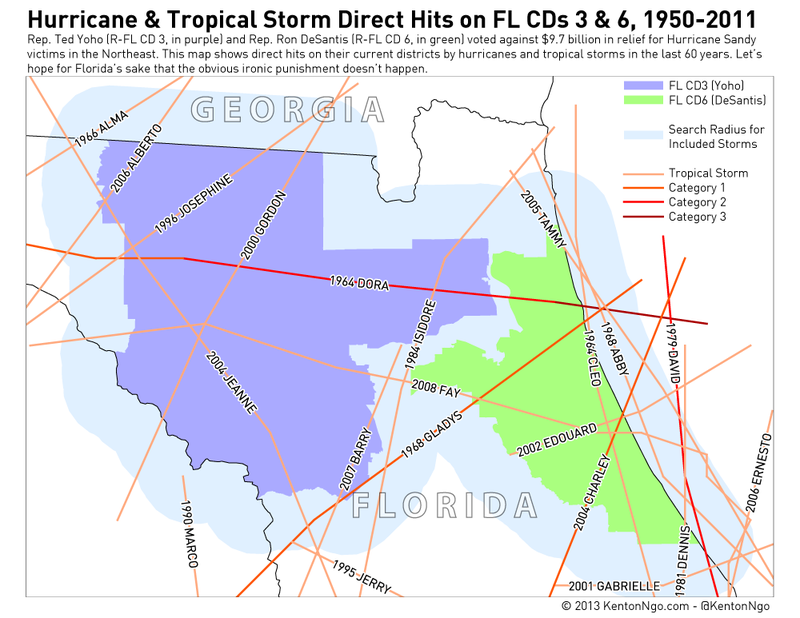 Hurricanes and tropical storms are massive systems that have effects hundreds of miles from the core, so this is only a sampling of the destruction that storms like Sandy have wrought on Yoho and Desantis’s North Florida districts. TS Debby’s track, which produced the flood of my apartment complex above, is not yet in the IBTrACS database I sourced the hurricane data from.